We just received a very generous donation in memory of Jessica Ridgeway. Jessica, whom we never met, had a huge impact on myself and the girls. We have followed very closely the news involving this beautiful little girl who was taken tragically last October. 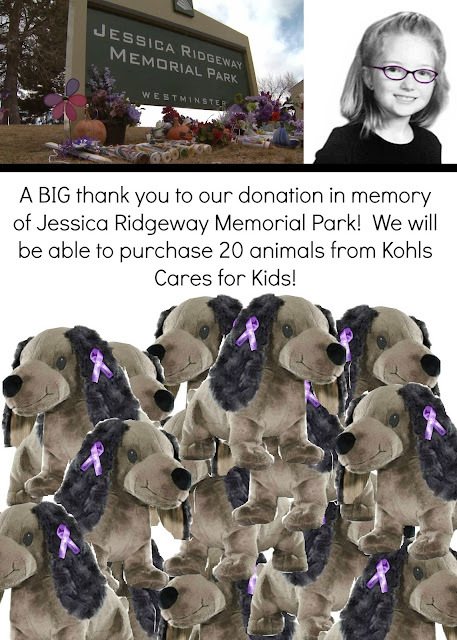 Her family and the community came together and renamed the local park in Jessica's memory as the Jessica Ridgeway Memorial Park (http://www.westminsterlegacyfoundation.org/Jessicaspark.aspx). The park will open soon and it's a beautiful place that was designed based on Jessica's favorite colors and activities. Not only did they create a new type of swing in Jessica's name but they even have this great knock-knock joke area that her former students help create. The park will be an incredible place to honor Jessica's memory, her family, friends and the community. We are very honored to receive this gift!